Happy New Year! We hope you and your family enjoyed a wonderful and relaxing holiday season. To kick off 2016, we are thrilled to share the first issue of a new regular e-newsletter from Women’s College Hospital Foundation. We look forward to keeping you updated on the impact of your generosity, sharing news and activities related to the hospital and providing you with more ways to engage with your WCH. Your feedback is important to us, so please get in touch to share your comments and suggestions! 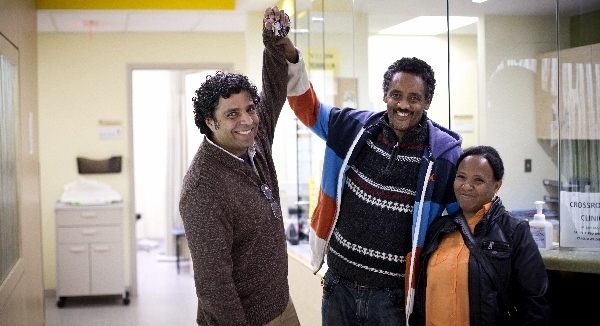 Samson was among the first patients of Women’s College Hospital’s Crossroads Clinic, Toronto’s first and only hospital-based refugee health centre when it was established in 2011. He had arrived in Canada earlier that year, having fled persecution in his home country of Eritrea. With the support of the clinic’s staff, including its founder and director Dr. Meb Rashid, Samson says he and his family found the courage and healing they needed during an overwhelming time in their lives. With thousands of people arriving in Canada each year as refugees, including 25,000 currently escaping the Syrian Civil War, the work of the Crossroads Clinic is more urgent than ever. Click through to learn more about Samson’s story and how your generosity is helping WCH give new Canadians health and hope for a brighter future. A global leader in women’s mental health treatment and research, Women’s College Hospital is transforming mental healthcare for women and families. This year, WCH and WCH Foundation will be proudly participating in Bell Let’s Talk Day on January 27, an annual opportunity for Canadians to join a national conversation about mental health, end the stigma and raise critical funds for life-changing mental health programs and research. Take action by engaging in this important conversation — follow us on Twitter @wchf and @WCHospital or on Facebook at facebook.com/wchfdn or facebook.com/wchospital. For Nadine Moore, Women’s College Hospital is the place that helped her find what she’d been searching for her whole life: the ability to believe in herself. A patient of WCH’s Women’s Mental Health Program, Nadine says that the caring and support she receives at the hospital have profoundly changed her life and outlook. Click through to meet Nadine and learn how you can change the lives of other women like her by advancing WCH’s Women's Mental Health Program. Every month, Larry Lamantia donates to Women’s College Hospital in honour of his “late and lovely” wife, Tina, who volunteered with the hospital for 30 years. As time goes on, each gift is more meaningful than the last: Larry, who himself volunteered with WCH for 12 years, says that his donations keep Tina’s memory and impact alive at a place she loved to support. Click through to learn more about how you can celebrate a loved one by making a donation in their honour or memory. From the time it was founded in the late 19th century, Women’s College Hospital has championed equitable access to healthcare for all women and families. This image is from a 1928 campaign advocating for accessible, high quality healthcare for women and families from all walks of life. Click through to find out how you can learn more about WCH’s extraordinary history by accessing The Miss Margaret Robins Archives. In a recent mailing, we asked annual donors to share words of support for women receiving treatment at WCH’s Cardiac Rehabilitation Program. Donors responded with warmth and generosity, and their messages are now on display to inspire patients while they exercise in the Cardiac Rehab gym. Here’s just one wonderful example of a heartfelt message we received! Every December, Canadians come together to celebrate Giving Tuesday, a day dedicated to making a difference by supporting causes close to our hearts. We’re thrilled to announce that with your support, over $3,300 was raised on Giving Tuesday 2015 to help Women’s College Hospital transform healthcare for women and families everywhere!